Book today and enjoy exclusive savings on your next stay at Centra Government Complex Hotel & Convention Centre Chaeng Watthana, Bangkok. Staff at reception and the Bistro very friendly, good food too!. near admin court near airport Very quiet. Big Parking area. Upgraded us for free to a two bedroom suite! Pleasant surprise there. Not much to do nearby. A little isolated. Great service, room amenities, and pretty tasty room service. FREE SHUTTLE, CLEAN AND NEAR AIRPORT I BOOKED SUPERIOR BUT THE MANAGER WAS KIND TO UPGRADE SO I STAYED IN SUITE ROOM THAT HAVE ONE SITTING ,TWO BATH ,ONE BED ROOM .IT IS 60 SQM. WITH FREE TWO CANS OF COKE AND LITTLEBOXES OFORANGE JUICE. THERE IS NO SWIMMINGPOOL BUT FITTNESS ROOM AND TABLETENNIS NO BALL . Healthy food, clean comfortable rooms, friendly staff Fantastic and very comfortable!!! The hotel has the best location to renew visa. On my arrival to the hotel I was upgraded to a suite on the 10th floor which is marvelous. Restaurant serves delicious Thai gastronomy and good wine. Hotel employees at counter were of good assistance. Positive: Next to conference room. Room facility and restaurant/cafe are very reasonable. Receptionists, house keepers and all staff are very polite, kind and responsible. Negative: Nothing in particular as long as you have some purpose in the Centra Government Complex. Positive: The beds were very comfy and the shower was beautiful and huge. We ordered room service which was good. This is the best accommodation if you want to convene with Royal Thai Government Officers. 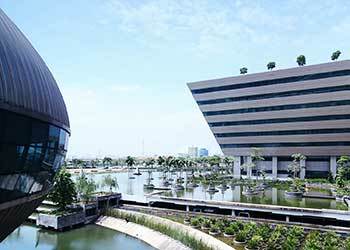 Since it is within the heart of central government complex where most of the Thai government offices located. Very convenient transportation to and from the both international airports. Just few seconds walk to the meeting venue next door. Living and meeting facilities are well equipped enough for the purposes. No entertainment facilities to disturb your concentration to the meeting. If you love jogging and biking, this isolated Government Complex is large and safe enough for those exercise. The Hotel is located in probably the quietest and safest part of Bangkok. A Huge Hotel opposite the Headquarters of Royal Thai Army. I was booked for a Superior Room and was upgraded to a Deluxe Room on Check in. It was a large room with Mini Refrigerator, a flat screen TV and a big comfy bed. 2 juices packs, 2 cola cans were provided as complimentary. 2 water bottles were provided daily since the tap water in Bangkok is not safe for consumption. Morning Buffet breakfast is huge here. Great variety in cuisines. For me the location was the only low during my 3 night stay in Bangkok. It costed me quiet a lot to reach to Siam (central Bangkok). I found very few Thai people who could speak in English. However, the staff here were good with English. They were very helpful in suggesting me to travel to Ko Kret, an island few kilometers from the Hotel; since Chaeng Watthana has nothing to offer for tourists. They prepared a well planned note telling me how to make my travel to that beautiful island successful. The hotel also follows the policy of trying to be as eco friendly as possible. A wonderful place to stay when it comes to a Business related tour.